Artist Carl Miles (1875-1955) created this fountain, which is made of bronze and marble. 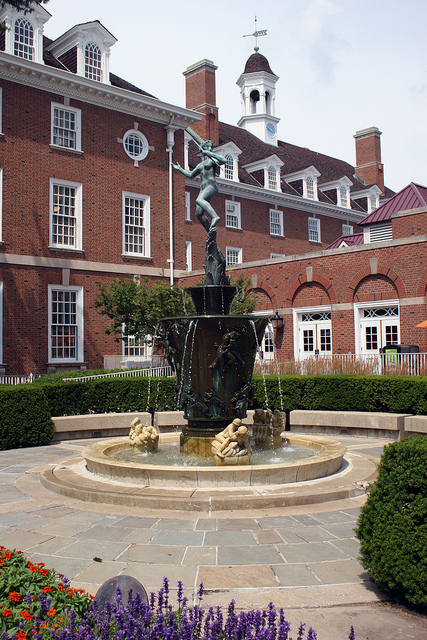 The Diana Fountain, reaching 15 feet high, can be found in the west courtyard of the Illini Union. It was acquired as a gift in 1971 through the Class of 1921 and Time Incorporated. In 1928 the architectural finn of Holabird and Root commissioned this delightful fountain for the owners of Chicago's Michigan Square Building (Time-Life Building after 1945). It was Milles's first work created solely for an American site, a version of the Diana Fountain he had fashioned a year earlier for the Swedish Match Company in Stockholm. The Chicago piece stood for nearly four decades in the center of a spacious modem interior court surrounded by smart shops and tiers of angular stairways, but with the building's sale and impending demolition, the work faced an uncertain fate until Samuel Lichtmann, a Chicago architect once in Holabird and Root's employ, arranged to have it donated to the university. Lichtmann's fellow alumni of the class of 1921 raised $50,000 to dismantle, transport, and reset it, and in June 1971 it was rededicated on the occasion of their fiftieth reunion. Frances B. Watkins, class secretary, expressed her "exhilaration" at obtaining the valuable artwork for the Urbana campus and told of her special pleasure that Time Incorporated had donated it because of the "eminence of the College of Fine and Applied Arts." When the fountain is turned on during the long summer months, it imparts a sensation of coolness to the lllini Union's patio. The goddess of the hunt-a pale green figure of patinated bronze-holds a bow and balances precariously on schematized, Art Deco-style fern fronds, her slender body turning sharply as if to catch sight of some fleet-footed animal running past. Below the vegetation, two concentric bronze urns fonn the base. The top um is plain but the lower one has figures in such high relief that they appear almost in the round. The figures include four nymphs, one being attacked by a leering satyr; a centaur chasing eight wild boars; and a unicorn, a mythical beast whose presence here alludes to Diana's chastity. The round water basin at ground level is of Lightly veined, buff-colored marble. Within it, one pair of nymphs lolls in languorous indolence and another cavorts playfully, while a third figural group is of a particularly repulsive satyr couple relishing the spectacle being played out before them. In Sweden, Milles's work had been of a decorative or commemorative nature-fountains and monuments containing bold, often exuberant animals, spirits, sea gods, mermen, sunbathers, archers, and dancing maidens, and more serious sculptures involving Nordic religious and historical themes. The university's fountain differs from the Stockholm prototype in subtle yet discernible ways, perhaps reflecting Milles's preconception of American taste. In the European original, only the goddess, several birds perched in delicate tendrils, and a peacefully sleeping boar, deer, and satyr appear. In the Illinois version, however, the arrangement is more complex, the participants more vigorous, and the wide awake satyrs and voluptuous nymphs put into a context both violent and sexual. In 1921 Lorado Taft recognized Milles as a gifted artist whose sculpture was "exceedingly up to date" and whose apprenticeship with Emmanuel Frerniet equipped him to cope with all subjects, "from heads of poets to prehistoric monsters." Robert Allerton, the university benefactor and art connoisseur, found Milles's work so compelling after seeing his work at the Tate Gallery in London in 1927 that he initiated a successful movement in Chicago to purchase a replica of the Triton Fountain in Lidingo for the Art Institute; and two years later he ordered an original casting of the magnificent Sun Singer for his own estate (now Robert Allerton Park) near Monticello, Illinois. With Milles's popularity growing in the States, the sculptor made his first trip here in 1929, and in 1931 he settled in Mich.igan as a professor of sculpture and head of the department at the Cranbrook Academy of Art in Bloomfield Hills. He lived there until 1951. Besides the Allerton Park and Chicago Art Institute sculptures, major American examples of this work are the Meeting of the Waters Fountain outside Union Station, St. Louis; the Peace Monument in the City Hall at St. Paul, Minnesota; and the Aganippe Fountain, a piece that once graced New York's Metropolitan Museum of Art and is now at Brookgreen Gardens, near Charleston, South Carolina. Muriel Scheinman, “Diana Fountain, 1930,” ExploreCU, accessed April 21, 2019, https://explorecu.org/items/show/4.